But unlike "toy" machines, the Necchi TM8 sewing machine has high quality internal components, including a jam-proof drop-in bobbin and horizontal full rotary hook. Convenient extras include a built-in needle threader, one-hand thread cutter, fail-safe needle insertion, and quick foot conversion. 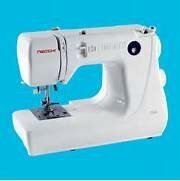 Take it out for quick projects at home, or take it along for sewing on-the-go. Either way the TM8 is a great little performer.